Plants cespitose, not rhizomatous. Culms 25-90 cm tall, 0.5-1.6 mm thick, glabrous; nodes 3. 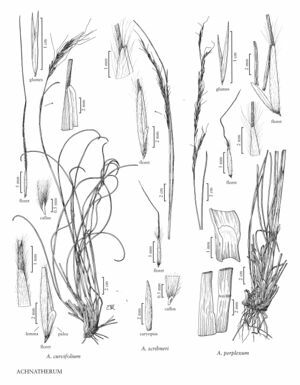 Basal sheaths becoming flat and papery, margins ciliate distally; collars glabrous, with tufts of hair on the sides, hairs on the basal leaves to 1.5 mm, hairs on the flag leaves 1-2.5 mm; basal ligules 0.3-0.8 mm, truncate, erose, ciliate, cilia 0.2-0.4 mm; upper ligules to 1.5 mm, asymmetric, obliquely truncate for most of their width, abruptly longer on 1 side; blades to 30 cm long, 2-5 mm wide, flat or involute, long-tapering. Panicles 7-21 cm long, 0.5-1 cm wide; branches appressed to ascending, straight. Lower glumes 10-17 mm long, 0.7-1.2 mm wide, exceeding the upper glumes by 2.5-4.5 mm, apices tapering, often slightly recurved; florets 6-9.5 mm long, 0.6-1.1 mm thick, fusiform, terete, widest at or below midlength; calluses 0.5-1.5 mm, sharp; lemmas evenly hairy, hairs at midlength to 1 mm, apical hairs 2-3 mm, ascending, apical lobes 0.3-0.5 mm; awns 13-25 mm, persistent, usually once-geniculate, first segment scabrous, terminal segment straight; paleas 2.5-3.5 mm, 1/3 – 1/2 as long as the lemmas, pubescent, hairs not exceeding the apices, apices rounded; anthers 3-5 mm, dehiscent, not penicillate. Caryopses 5-6 mm, fusiform. 2n = 40. Okla., Wyo., Colo., N.Mex., Tex. Achnatherum scribneri grows on rocky slopes, in pinyon-juniper and ponderosa pine associations at 1500-2700 m, from southeastern Wyoming through Colorado to Arizona, New Mexico, western Oklahoma, and Texas, and in Capital Reef National Park, Utah. At present, the Utah population appears to be disjunct from the species' primary range; this may reflect a lack of collecting. Achnatherum scribneri is similar to A. parishii, A. robustum, A. perplexum, and A. lobatum, differing from all of them in its sharp calluses.